In the beginning, the relationship is characterized by a drive to seek and maintain physical closeness. But physical proximity through the senses is only the first stage of this attachment relationship, and during the first year of life, it is the only way that babies can attach. Breastfeeding, cosleeping, and babywearing certainly stimulate the senses and keep babies physically close to their primary caregiver – Mama – but they are not the only ways that a parent can provide for the child’s attachment needs. If attachment through the senses and physical closeness remain the only way of attaching, the relationship will be shallow, insecure, and prevent the child from becoming his own person. Child developmental specialist Gordon Neufeld, PhD, has broadened our understanding of attachment relationships and refers to attachment at the level of the senses as only the first root. Just as a tree must develop rich and deep roots in order to bear fruit, so too, children must develop deep attachment roots in order to develop the characteristics of a mature person. Dr. Neufeld has put the pieces of the attachment puzzle together and explains the development of five more roots: Beyond senses, these roots are sameness, belonging and loyalty, significance, feeling, and being known. Besides physical proximity, children need to be like their parents. This is another way they can keep parents close when they are busy exploring the world. This is why they imitate their parent’s speech and play with their parent’s possessions such as cellphones, keys, utensils, and shoes. This is still a rather shallow way to maintain connection, so nature provides a third root during the third year: belonging and loyalty. The child now has a sense of “My Mommy” or “My Daddy” and is loyal to his parent’s ideas and directives; he wants to be good for them. This is still a shallow way of attaching for it leaves no room for a child’s own will. If parents maintain their responsibility for the relationship with their child, by the fourth year, nature begins to provide some deeper roots so the child will have more room for the growth of his own ideas, opinions, feelings, goals, likes, and priorities. His parents give him the feeling that he is special and important to them. Now it’s OK for the child to think and feel differently because his very existence is dear to his parents. Then, by the fifth year, he can give his heart to them and soon after that, he wants to share with them all that is within his heart. He now doesn’t need to be physically close to his parents in order to feel secure in his relationship with them. He can venture forth from home base, feeling they continue to be his source of guidance and support until he develops enough maturity to exercise good judgment and hold on to his own identity, boundaries, and values. This is how the child develops into a mature and independent adult and how culture is transmitted from generation to generation. This is important awareness for parents of today’s generation, because even if parents do not breastfeed, cosleep, or use baby carriers, they can still develop a deep attachment relationship by cultivating these roots. Parents who foster or adopt older children, mothers who work full time, mothers who are not able to breastfeed or babywear, and parents who are divorced can all provide the attachment needs of their children. In all of these circumstances, what is called for is an adult who is willing to take responsibility for the relationship and provide a strong, secure home base so the child can grow. The key lies in cultivating all six roots of attachment, and it is never too late to start. Please note that Dr. Neufeld refers to the fifth root as love. The child falls in love with his parents, if the relationship unfolds as nature intended. We see signs of this when the child draws hearts and expresses his love in other ways to his parents. He wants to marry them and stay with them forever! Thank you, Shoshana, for this excellent synthesis of Neufeld’s important attachment model. Very necessary to add nuance and refinement to the simplistic caricature of attachment promoted by coverage like Time’s. 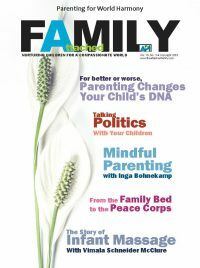 I love his work, and cite it quite extensively in my new book “Parenting for Peace.” I myself just posted a response to the Time assault: http://marcyaxness.com/parenting-for-peace/time-magazine-not-mother-friendly-or-child-friendly/. I think that what lies beyond attachment parenting is progressive parenting. Continuing to identify and meet a child’s needs whatever they may be. Thank you for acknowledging the choice available to mothers not to cosleep, breastfeed, or wear their babies but still practice attachment parenting. I did do all of these things, with my children, however my best friend chose not to for personal reasons. She did however choose to homeschool and protect her children form toxic social situations and media. Her four children are some of the most attached and outstanding children I’ve met. They are incredibly grounded and secure in their relationship to their mother and family. The two oldest are 18 and 19, and they’ve always been very in-sync with their mom and her values. I respect her choices fully and very much appreciate that this article allows for a wider breadth of AP methods. Well done.